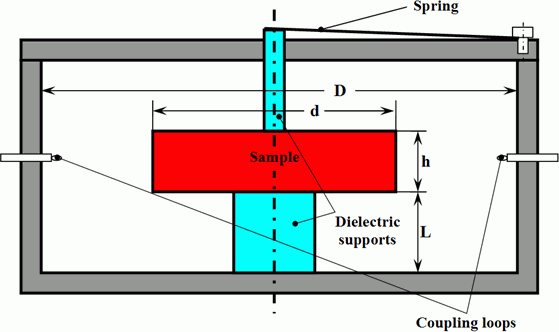 Application TE01δ mode dielectric resonator technique is intended for very precise complex permittivity measurements of bulk low loss disc or cylinder shape dielectric ceramics. Additionally, with this technique the thermal coefficients of permittivity and the dielectric loss tangent can be measured. With this application QWED offers dedicated software for the rigorous computations of the complex permittivity as well as cavities of different size with adjustable coupling mechanisms and low loss dielectric supports. All TE01δ mode dielectric resonator cavities are custom made. Operational frequency range Measurement frequency depends on the diameter, height and permittivity of the sample under test, and for typical samples is in the range of 1 ÷ 10 GHz. Measurements at higher frequencies are possible by employing either smaller cavities and samples or higher order quasi TE0mn modes. Sample dimensions To obtain the highest precision of the measurements, the size of the sample under test should be in the range of 0.25÷0.6 of the size of the cavity (for both dimensions: diameter and height). Measurement procedure Sample under test is placed in a metal cavity on a low loss dielectric support. Resonant frequency and Q-factor of the TE01δ are measured. Dedicated software is provided for permittivity and dielectric loss tangent determination.